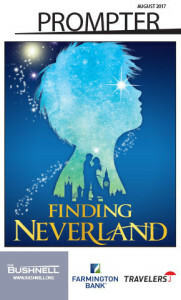 With a title like Finding Neverland one knows it is certain to include boys who won’t grow up, fairies, pirates, a dog named Nana, and a whole lot of wonder and imagination. So I ask myself how was it that I essentially knew nothing about this 2015 Broadway darling (no pun intended)? Inspired by the 1998 play The Man Who Was Peter Pan by Allan Knee, as well as the 2004 film adaptation, Finding Neverland, with screenplay by David Magee and music by Jan A. P. Kaczmarek, and starring Johny Depp; this was later retooled into an original musical with music and lyrics by Gary Barlow and Eliot Kennedy, book by James Graham, and which starred Michael Morrison and Kelsey Grammer. 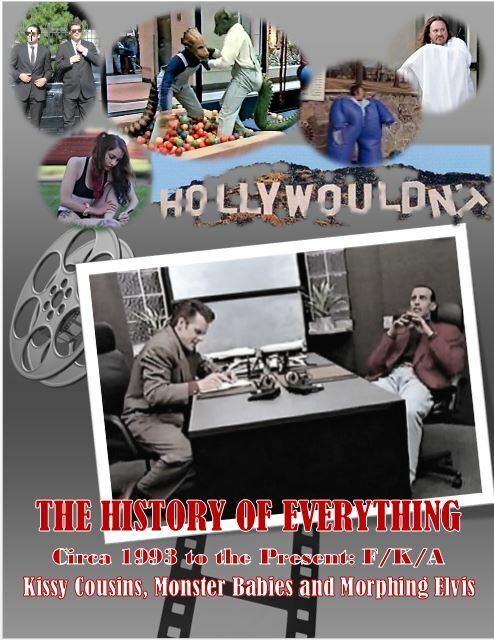 Based loosely upon the life of J.M. Barrie and his relationship with widow Sylvia Llewelyn Davies and her children George, Peter, Jack, and Michael (there also was a fifth son, Nicholas who isn’t part of the story), it spins a condensed and mildly fictitious tale of the creation of the iconic and timeless story of Peter Pan. From the get-go I was hooked. (Sorry!) In fact I turned to my husband about 20 minutes in and whispered, “I’m in love with this show!” Based on one of the most beloved stories which serves as inspiration for many of us never to let go of our inner child, the musical is packed to the brim with delightful songs, brilliant acting, stunning choreography, spectacular set design, projections, and illusions, and alternating moments filled with laughter and tears. Feeling like a wide-eyed child, I think I had a smile plastered across my face from beginning to end (punctuated only by the wiping of my eyes). Barrie, a novelist and playwright, may indeed have been Peter himself – a childless, impish, and creative lover of stories and storytelling, a “Betwixt-and-Between.” It was perhaps happenstance or fate that he met Sylvia’s puckish sons in Kensington Park while facing a writer’s slump that was only worsened by his overbearing producer, Charles Frohman. The boys, his muses, stirred something inside of him with their playful, devil-may-care enthusiasm, sparking bits and pieces of what would later become the titular and altogether magnetizing character of Peter Pan. But those would not be the only sparks that would fly, for Barrie’s life on the home front was entirely dismal – married to vapid shrew Mary – it was Sylvia who brought out the best in him, and it was this love, consummated or not, that flowed through his veins, enlivening him. That, however, was much to the dismay of her domineering and haughty mother, Mrs. du Maurier. 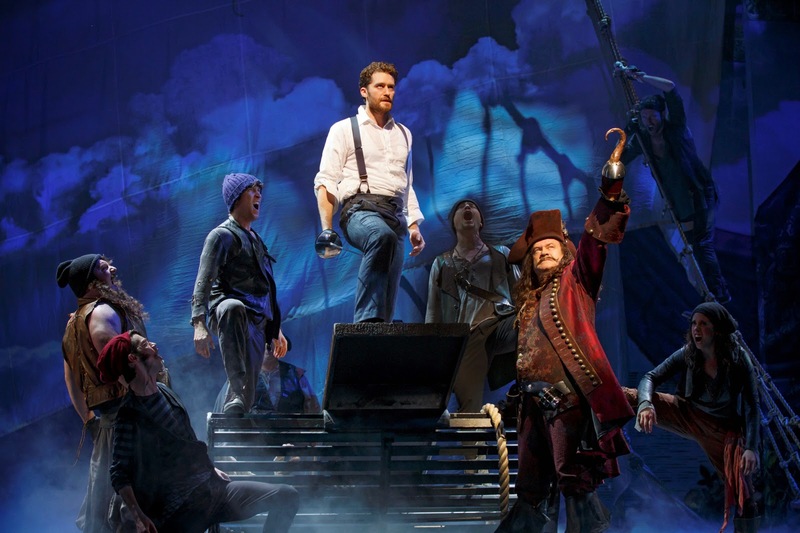 Finding Neverland is filled with dynamic, moving, and uplifting moments. It is a credit to Barrie’s flights of fancy, as well as Graham, Barlow, and Kennedy’s creative collective vision, but further, to the top-notch direction of Diane Paulus; choreography by Mia Michaels; music supervision by Fred Lassen; and orchestrations by Simon Hale. All the more, I must pay hearty praise to the entire cast. Principals, Billy Harrigan TIghe as J.M. Barrie was the charming protagonist and hero to not just the Davies children but to every generation thereafter. Christine Dwyer was the strong-yet-vulnerable beauty, Sylvia Llewelyn Davis – a songbird of the first-order. TV and Broadway veteran John Davidson nailed it as the loud, gruff Charles Frohman as well as the hysterically funny Captain James Hook thrust forth from Barrie’s gray matter. Karen Murphy as Mrs. du Maurier nailed every nuance of this supercilious and formidable character – much as I imagine she must have in the National Tour of Mary Poppins as “Holy Terror” nanny Miss Andrews or Off-Broadway’s Zombie Prom as the battle-ax principal Delilah Strict. The children in this production are outstanding – and all of them rotate roles – their performances reach the level of seasoned professionals. 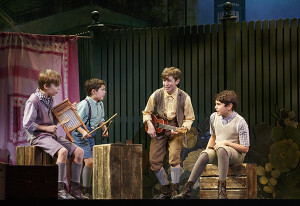 Turner Birthisel as Peter, Jack, or Michael; Connor Jameson Casey as George, Peter, or Jack; Wyatt Cirbus as Peter, Jack, or Michael; Bergman Freedman as George, Peter, or Jack; Tyler Patrick Hennessy as Jack or Michael; and Colin Wheeler as George, Peter, or Jack. Kristine Reese as Mary Barrie (also Ensemble) was wonderful as Barrie’s wife and the woman you love to loathe. Kudos to the rest of the Ensemble, most of whom were part of Frohman’s “acting troupe”: Christina Belinsky; Caitlyn Caughell (also as Miss Jones, u/s Sylvia, Mrs. du Maurier, and Mary); Sarah Marie Charles (u/s Sylvia and Mary); Adrianne Chu (also Wendy); Calvin L. Cooper; Dwelvan David (also Mr. Henshaw and humorously, Nana); Nathan Duszny; Victoria Huston-Elem (also Miss Bassett and u/s Mrs. du Maurier); Thomas Miller (also Elliot); Noah Plomgren (also Lord Cannan and u/s J.M. Barrie); Will Ray (also the troupe’s Captain Hook and u/s J.M. 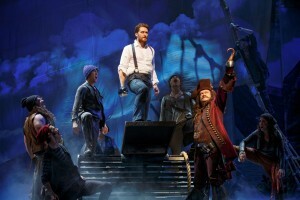 Barrie); Corey Rives (also Albert); Dee Tomasetta (also Peter Pan and associate choreographer); Matt Wolpe (also Mr. Cromer and u/s Charles Frohman/Captain James Hook); Melissa Hunter McCann (Swing and Dance Captain); Connor McRory (Swing and Assistant Dance Captain); and Matthew Quinn (Swing and Assistant Dance Captain). One cannot give a huge nod or paw to Sammy, the furry beast who so deftly portrays Barrie’s loyal companion and dog extraordinaire, Porthos (as well as his handler, Tyler Garstka). National Tours are like little pieces of Heaven which have floated off of the Great White Way and land in theatres near you. I’ve always found it incredibly amazing how these shows can be mounted and dismounted, then moved from venue to venue. It takes more than a village – and shout-outs to Scenic Designer Scott Pask; Costume Designer Suttirat Anne Larlarb; Lighting Designer Kenneth Posner; Sound Designer Jonathan Deans; Projection Designer Jon Driscoll; Hair & Make Up Designer Richard Mawbey; Paul Kieve for Illusions; Air Sculptor Daniel Wurtzel; the Production Resource Group for Flying Effects; and all of the others who contributed their parts to the dazzling whole. 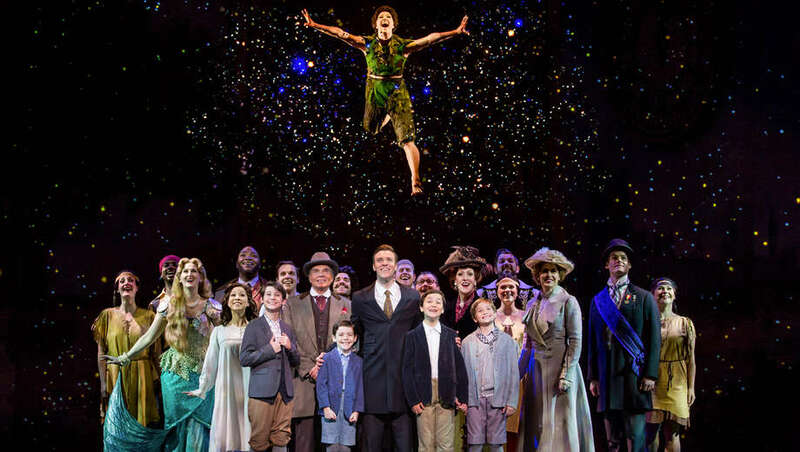 Finding Neverland, as the enchanting story of Barrie’s imagination and brilliance, is like the gift of a fairy’s spellbinding light – bringing instant magic to your very soul. Catch it before flies away! When I heard that Finding Neverland was going to be at The Bushnell, I put it in my Reddit category of mildly interested. Don’t get me wrong, I am the quintessential Peter Pan, the child who never grew up, to which I am sure my wife and co-reviewer would testify. I love the story of Peter Pan and have seen countless versions and spinoffs of it through my theatre-going career including a great performance my stepson was recently in at his middle school. I still remember fondly of Mary Martin playing Peter Pan. Add to that all of the versions of Peter and the Starcatcher I’ve seen and mildly interesting category becomes readily apparent. I mean, how many different versions of West Side Story can a reviewer see and write about? As usual, my gut instincts were totally wrong. Even though Finding Neverland was about Peter Pan, it is totally a new incarnation with a completely different perspective. 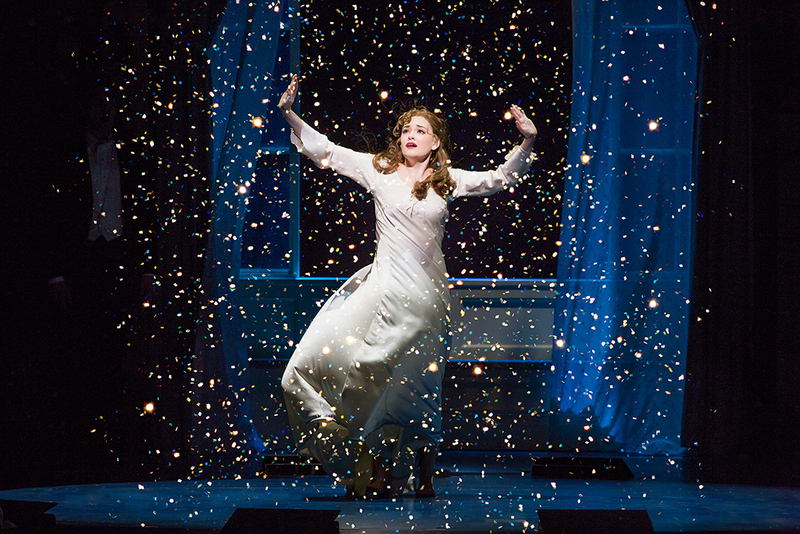 My Reddit category shifted when I learned that The Bushnell’s Finding Neverland was a magical, moving, and mesmerizing piece of theatre. As I watched this beautiful story about J.M. Barrie’s relationship with a family who inspired him to create Peter Pan, somewhere my brain freeze warmed up and I remembered there was highly regarded 2004 film that the play is based upon starring Johnny Depp and Dustin Hoffman. And now, of course, I want to see the film. Thank goodness for digital downloads. Back to the play. It was a stunning tour de force with brilliant acting, singing, and dancing. While it’s true that The Bushnell is noted for having National Tours of great shows and any show there should be of Broadway caliber, this particular one transcended Broadway caliber to a totally new plateau in a place of theatre to Neverland. Director Diane Paulus did an incredible job navigating this show with such a large cast and so many movable parts and yet creating a sensory extravaganza at the same time. The entire cast was awesome and I always feel somewhat guilty in not individually acknowledging all of the talent including swings and understudies and all of the crew (including the road crew) that contribute to a production like this – without any of whom this particular production would not be what it is. So forgive me for not mentioning everyone, but as a producer and director myself, I know and appreciate all of collaborative process and all the cooks that have a part in making the delicious stew. Since the story involves a play within a play – or rather the creative imagination of J.M. 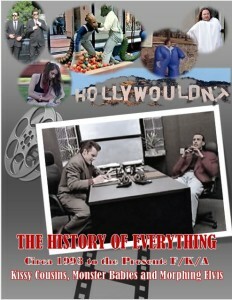 Barrie which takes place on stage – there are the actors who play real life people who interacted with J.M. Barrie and then there are the members of the acting troupe itself. Accordingly, many of the actors, with the exception of J.M. Barrie, did double-duty playing the actors playing the actors. The play not only involves this multi-layering, but via the conceit we can actually see, at least in Mr. Barrie’s case, how the creative process and vision come together from concept to finished product. Billy Harrigan Tighe is wonderful as J.M. Barrie. How can you not love an actor who conveys a warm, loving, intelligent, creative individual who has a weakness for kids and children and can sing and dance like there’s no tomorrow? I was thrilled to see the enormously talented John Davidson as Charles Frohman (the part that Dustin Hoffman played in the film version). I grew up thinking that John Davidson was a great TV talk show and game show personality. Who would have thunk that he also is a great song and dance man! 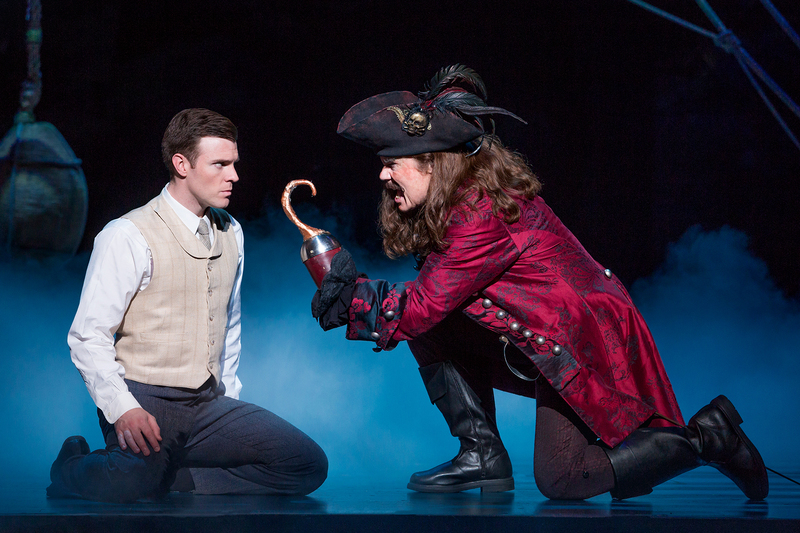 He doubled as a devilishly Captain James Hook, the dark alter ego of J.M. Barrie. Dwelvan David was wonderful playing the part of the pompous stage actor Mr. Henshaw who begrudgingly (but hysterically) plays the part of Nana the dog. Christine Dwyer proved both her acting and singing chops as Sylvia Llewelyn Davies, J.M. Barrie’s love interest as well as his muse. Karen Murphy was spot-on as the hard-barked-upper-crusted-lady-with-the-heart-of-gold Mrs. du Maurier. I would be remiss if I didn’t at least mention Dee Tomasetta who definitely channeled Mary Martin in her portrayal of the actor playing Peter Pan. Finding Neverland is proof that there is magic in the world which you can find in live theatres like The Bushnell.